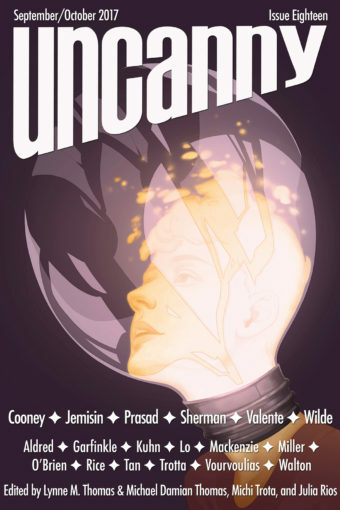 Welcome to Uncanny Magazine Issue Eighteen! All of the content will be available for purchase as an eBook (PDF, EPUB, MOBI) on September 5, 2017. The free online content will be released in 2 stages—half on September 5, and half on October 3. Featuring all-new short fiction by N. K. Jemisin, Fran Wilde, C. S. E. Cooney, Catherynne M. Valente, Vina Jie-Min Prasad, and Delia Sherman, reprint fiction by Malinda Lo, nonfiction by Sophie Aldred, Cecilia Tan, Sarah Kuhn, Sam J. Miller & Jean Rice, and Sabrina Vourvoulias, poems by Jo Walton, Brandon O’Brien, Ali Trotta, and Gwynne Garfinkle, interviews with C. S. E. Cooney and Delia Sherman, and Ashley Mackenzie’s “Inspiration” on the cover. Episode 18A (September 5): Editors’ Introduction, N. K. Jemisin’s “Henosis” as read by Stephanie Morris, Fran Wilde’s “Clearly Lettered in a Mostly Steady Hand” as read by Amal El-Mohtar, and Jo Walton’s “Too Much Dystopia?” as read by Erika Ensign, and Julia Rios interviewing Fran Wilde. Episode 18B (October 3): Editors’ Introduction, Catherynne M. Valente’s “Down and Out in R’lyeh,” as read by Heath Miller, Ali Trotta’s “A Lovesong From Frankenstein’s Monster” as read by Amal El-Mohtar, and Julia Rios interviewing Catherynne M. Valente. Ashley Mackenzie is a freelance illustrator based out of Edmonton, Alberta with an interest in making thoughtful conceptual illustrations. 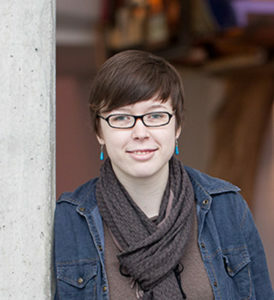 Some of her clients include The New York Times, Scientific American, The Washington Post and Tor, among others.